Growing up, Indiana University student Corben Andrews experienced early on the effects of poverty and the impact one can have on the world. When he was 5 years old, he accompanied his parents and church on a mission trip to Mexico, where the group built houses for people in need. Then in high school, Andrews volunteered, again through his church, at an orphanage in Guatemala, where he helped build and paint buildings for the young children living there. "I grew up with an appreciation of what we have in America and our impact on the rest of the world," said Andrews, a sophomore majoring in environmental science. It was during that trip to Guatemala that Andrews' interest in sustainability was also piqued, after he witnessed a community living among a trash dump and drinking water from a stream polluted with that nearby garbage. "It was terrible to see," said Andrews, a Bloomington native. "I saw all this trash and these people having to suffer from all these nasty chemicals. I came back home and got connected with some sustainability groups here." Andrews working at Hilltop Gardens and Nature Center. Photo by IU Communications. Throughout high school, Andrews was involved with his school's environmental club, helped build a school garden, volunteered at the Hoosier Hills Food Bank garden and was a member of Bring Your Bag Bloomington, a local group focused on the issue of single-use plastic bags. When it was time to attend college, Andrews knew he wanted to continue to focus on sustainability issues and study at the School of Public and Environmental Affairs. In addition to his studies, Andrews has served as a 2020 Sustainability Scholar through IU's Office of Sustainability. 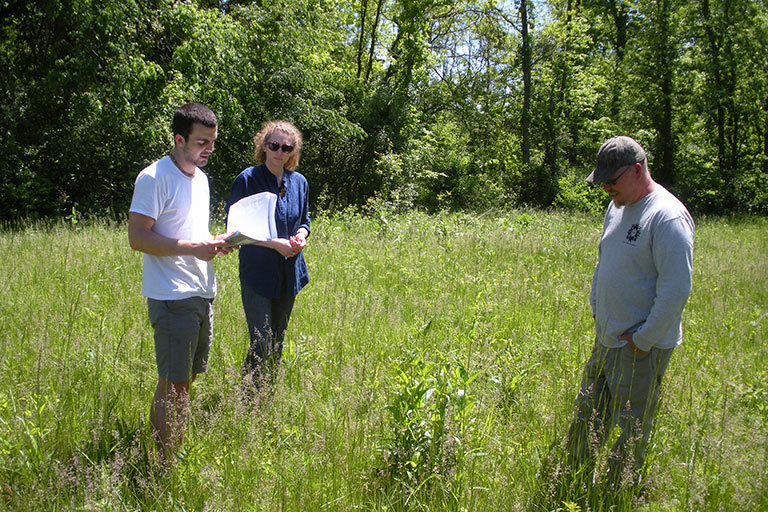 As part of his work, which he is continuing this academic year, Andrews worked with Heather Reynolds, an associate professor of biology, to study the effectiveness of turf grass as a prairie planting pre-treatment. 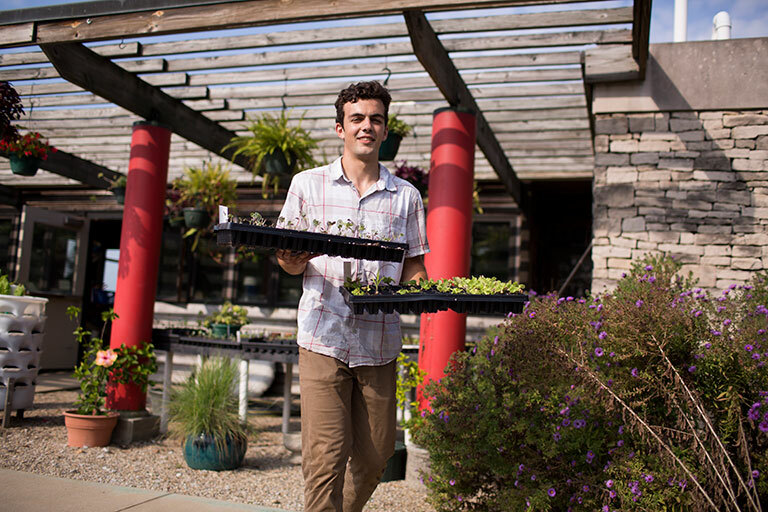 He also serves as the campus garden intern through the Office of Sustainability, focusing on creating interactive, edible gardening spaces on the IU Bloomington campus. One such space is at Hilltop Garden and Nature Center, an 8,500-square-foot garden that provides the campus and community the opportunity to engage in food production. "I really enjoy working at the garden," he said. "I get to be outside and I really enjoy just getting my hands dirty and the sense of community that happens there." As part of his work through the Office of Sustainability, Andrews will be volunteering at this year's Big Red Eats Green festival, tabling a booth for the Hilltop Garden and Nature Center. The food festival and farmers market involves local growers and restaurants committed to sustainable practices in addition to opportunities for students and community members to become involved in sustainability efforts. During his time at IU, Andrews has served as a 2020 Sustainability Scholar. Photo courtesy of Corben Andrews. Carissa Marks, a food working group intern with the Office of Sustainability and organizer of this year's Big Red Eats Green event, said Andrews not only has a passion for sustainability and food issues, but also has a way with encouraging others to educate themselves and become involved. "Corben recognizes and works hard to address the needs in our community, and I feel very fortunate to work so closely with him on food issues here in Bloomington," she said. "His down-to-earth personality encourages and inspires community involvement." Andrews has seen first-hand how powerful the Big Red Eats Green event can be. Attending it last year is what first interested him in volunteering with the Campus Garden Initiative. "I'm really excited about this year's festival and the new events happening this year," he said. "It is a great way for students to learn how to get involved and to educate themselves about eating healthy and local, sustainable food." It's events like Big Red Eats Green and programs such as his internship through the Office of Sustainability that Andrews said he enjoys most about his IU experience. Having the opportunity to do hands-on work and to work closely with the IU and Bloomington community as a whole, is not only enjoyable, he said, but has given him invaluable real-world experiences. "I like being busy and I enjoy the hands-on stuff," he said. "I feel like the opportunities I've had have given me a taste for what it is like to really work in the field of sustainability."